18, rue de Vaugirard | Mystère et boules de gomme ! 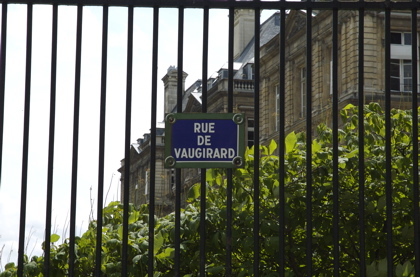 To be sure, rue de Vaugirard exists. It is the longest rue in Paris (over 4 km en longuer), and one of the oldest, being an ancient Roman road connecting Lutèce (now Paris) with Dreux. Its eastern terminus (beginning?) lies directly opposite the lovely Place de la Sorbonne pictured here (where my wife and I had a lovely déjuener at a cafe on the right, the name of which escapes me). What do you say we take a walk from here along Rue de Vaugirard and look for #18, the Belleau family residence? 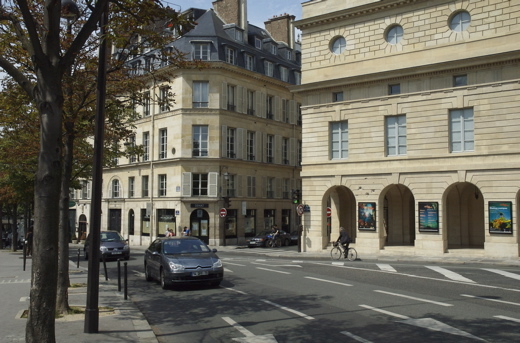 Rue de Vaugirard runs due west from here, intersects rue Monsieur le Prince, then arrives at the Place Paul Claudel. Here the rue des Médicis that borders the northeastern edge of the Jardin de Luxembourg intersects and merges into rue de Vaugirard. Looking to your left, you see the tall iron fence that rings the Jardin and through it, the eastern face of le Sénat. On your right (north) rue Corneille, which runs to the Place de l’Odéon, intersects rue Vaugirard. 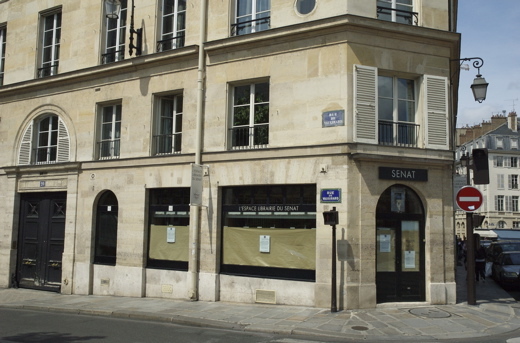 At this corner is a café, « Au Petit Suisse » for which there are some favorable reviews available online. 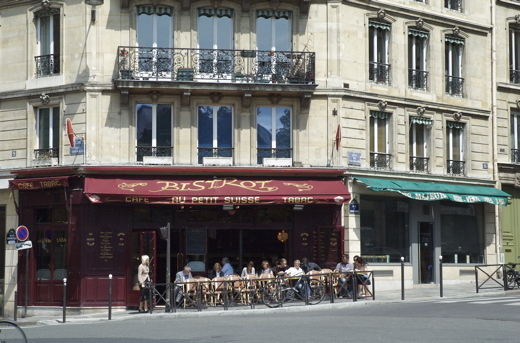 The address of the café is 16 rue de Vaugirard. 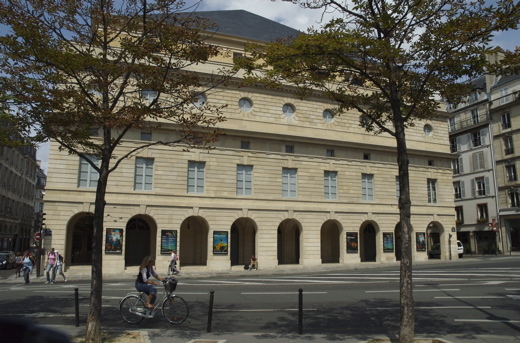 West of rue Corneille is the back of the Odéon Theater. No number is visible from the street, and indeed the Odeon’s street address is not on rue de Vaugirard, but is 2, rue Corneille. To the west, the Odéon is bordered by rue Rotrou and the next building along rue Vaugirard bears the number 20. This is the Librarie du Sénat. Le Sénat itself is now nearly directly to our south (our left as we walk down rue de Vaugirard). On a recent trip to France, a group of my students took an hour off to hunt down the infamous 18, rue de Vaugirard, hoping sans doute to catch Mireille qui sortait de chez elle…or at least to have their pictures taken in front of this apartment with such a beautiful view (except for the Tour Montparnasse–quelle horreur!) of the Jardins de Luxembourg. Please make note for future tourists that this new Mecca (which proved more of a draw than Jim Morrison’s grave), is, however utile pour apprendre le français, as fictitious as the rest of story! Editor’s note: Yes, indeed number 18, rue de Vaugirard is fictitious; for the very reason illustrated in Professor Black’s letter. Before FiA was filmed, we at Yale and at a few other institutions were teaching with a prototype course. 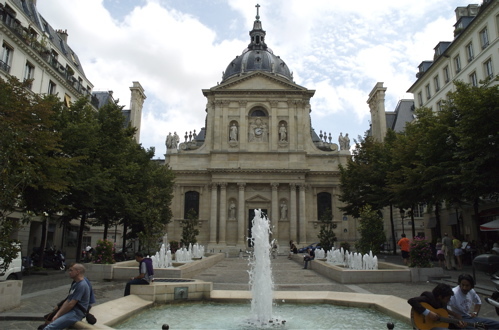 So many of our students would rush to the real building on rue de Vaugirard and ring the bell, hoping that Mireille would open the door, that we were obliged to move Mireille and her family twice. When we made preparations to film French in Action, we anticipated the problem would be, of course, worse after the program was seen by tens of thousands of students and millions of home viewers. 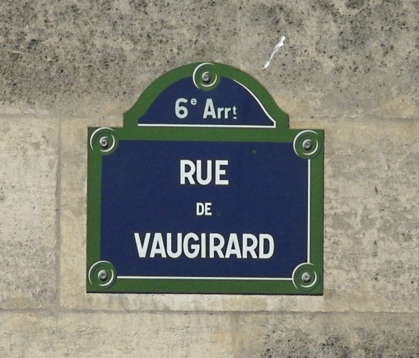 So, we had to find a number on rue de Vaugirard that would not pose a problem. I selected number 18 precisely because it does not exist. (If it did, it would be the back of the Odéon Theatre.) This solution created only a minor difficulty: whenever we wanted to shoot in front of Mireille’s house, the crew had to bring a ladder to take down the actual number, replace it with number 18, and put back the right number when we were through. So…what then is the address of the building featured as the Belleau’s 4th floor apartment with its vue imprenable? Sounds like a good subject for my next article. Stay tuned! Thank you so much for creating this blog!! I never studied FIA — I was a grad student language lab « teacher » where it was used and had to watch the same episodes over and over. I can’t wait to read all your posts. I hope you have « un taudis infecte » in there. 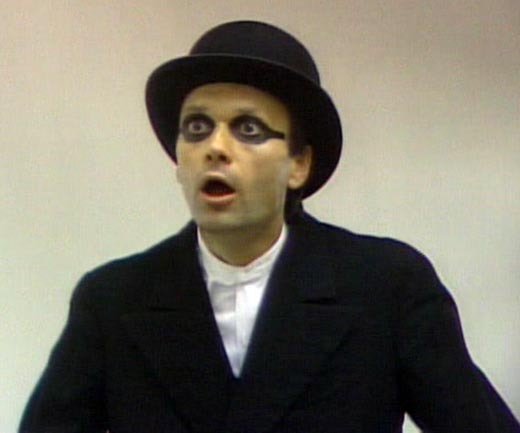 The dinner party was one of my favorites. I don’t know how some folks are lucky enough to get a couple of months in Paris. I have a hard enough time trying to squeeze a 2-week vacation out of my company. For people who can’t spend that much time in Paris, I recommend the Hilton hotel on ave. de Suffren, literally across the street from the Eiffel Tower. Nothing beats a lovely evening stroll to the Champ de Mars, and of course the Seine and the boats are just another short walk away. One of the most beautiful view in the world is of course of the Eiffel Tower from the Trocadero / Palais de Chaillot. That’s our neighborhood! Malheureusement, tout les magazin d’alimentation dans rue de Bretagne etes ferme pour « les vacances » ce mois. I have this site bookmarked, and will be back soon. Let me know how to contribute articles. I’m green with envy. For our vacation my wife & I rented a little studio apartment in the 3rd on the corner of rue Debelleyme & Rue de Bretagne, a couple of blocks from the Square du Temple. We loved the neighborhood. This trip was my reason for going back through FIA again and gave me the idea to start this site. We’d love to have you as a contributor to FIA fans. If you have time, I encourage you to contribute to the FIA wiki as you go through the lessons, or write an FIA-related article for us! We first came here 11 years ago on a « grande vacance » – spending a couple of months in a rented apartment in the 5th and another month in the Dordogne. We didn’t want to leave. Came back two years later and stayed for another couple of months. Then we started coming every year, and then every 6 months. We cried every time we left! We finally bit the bullet and bought an apartment in the 3rd. We’re going through FIA again in preparation for a month-long immersion course this fall. It was a great time. We had the same reaction to the city that you did and didn’t want to go home after a week (it was my first time there since I was 13 years old!). I envy you, both for having a chance to see Paris and trying to track down the sights in FIA. Paris est une ville magnifique. I went there last year for the first time and fell hopelessly in love with the city. Can’t wait to go back………………………..
Bravo to you and your wife for doing vos dévoirs on this! Great photos, too!